Can you melt any kind of chocolate to put into molds? I would love some great ideas on chocolate for dipping and mold making. Do you have to use a special kind of chocolate, or will any kind of chocolate do? Comments for Can you melt any kind of chocolate to put into molds? Any white cotton gloves will do. I know you can get them here at Candyland Crafts, but you may very well be able to find them at Walmart or Michaels, too, or some other local craft shop. Maybe even JoAnn Fabric would carry them. Where to buy chocolate gloves? Can they be purchased like at a hobby lobby or michaels walmart etc? That's a good question. You can use almost any type of chocolate for dipping or mold making. The difference will be in the final product, of course. I've used chocolate chips, gourmet chocolate, and even chocolate melts. The higher the quality of chocolate you use, the better your end result. I think, though, it is purely a matter of taste. Now, don't forget, there are little tricks to molding chocolate candy to get the best results. 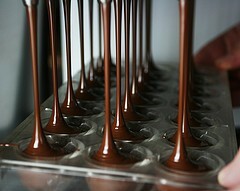 You may want to go to the extra trouble of tempering the chocolate so that it sets more firmly. As for dipping, if you add a teaspoon or so of shortening to the chocolate as you melt it, it will help it set better if you are making things like chocolate covered pretzels, etc. If you are just making fondue, you can simply melt and dip. There are plenty of chocolate fondue recipes if that is what you had in mind. Hope that answers your question. If anyone else has some advice, jump right in and add it here. The more the merrier.